Donald Trump melts down on Twitter over Meryl Streep's Golden Globes speech. 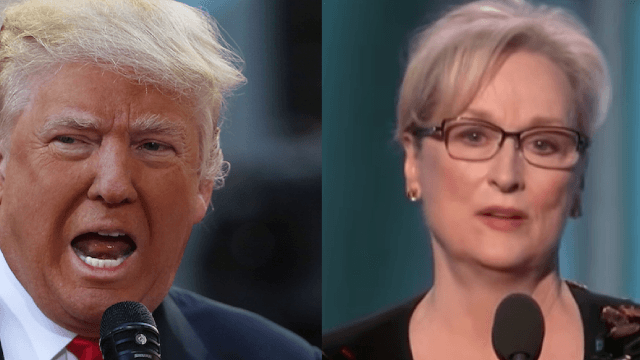 On Sunday night, Meryl Streep took aim at President-elect Donald Trump during the acceptance speech of her lifetime achievement award at The Golden Globes. Without ever mentioning his name, Streep thoroughly roasted the future president by saying, "Hollywood is crawling with outsiders and foreigners, and if you kick us all out, you'll have nothing to watch except for football and mixed martial arts, which are not arts." She also recalled the instance where Trump openly mocked disabled reporter Serge Kovaleski of the The New York Times. Like clockwork, Donald Trump took to Twitter to whine about being targeted in the legendary actress' speech. Someone get this snowflake a safe space, because he has been triggered HARD. What scandal are these tweets meant to distract us from again? Meryl Streep is overrated? Okay, now we all know that you've lost your mind. Of course, Twitter had some opinions on Trump's online temper tantrum. Good morning. Our president elect is currently tweeting insults at a 67-year-old woman who "attacked" him without even mentioning his name. Also LOL at the idea that MERYL F'ING STREEP is overrated. If anyone is rated exactly as highly as they should be, it is Meryl Street.